Prey Lang - It's YOUR Forest Too! | You can help save Prey Lang. JOIN US NOW! Prey Lang – It's YOUR Forest Too! You can help save Prey Lang. JOIN US NOW! Mr.Ros Larch key person of Prey Lang leader who living in Thalaborivat, Stuengtreng province and also commune council was fire him from commune council by district and provincial governor because of he support and involve with PLN to protect the forest and others advocacy.Early of Jan,2012 Anlong Phé commune chief and Talaborivat district and Stueng Treng provincail governor issued the letter to fire his position. On December 14, more than 200 Prey Lang Network and Friends of the Forest activists defied the efforts of Cambodian authorities to stop a prayer ceremony for Prey Lang in the renowned Angkor temple complex. 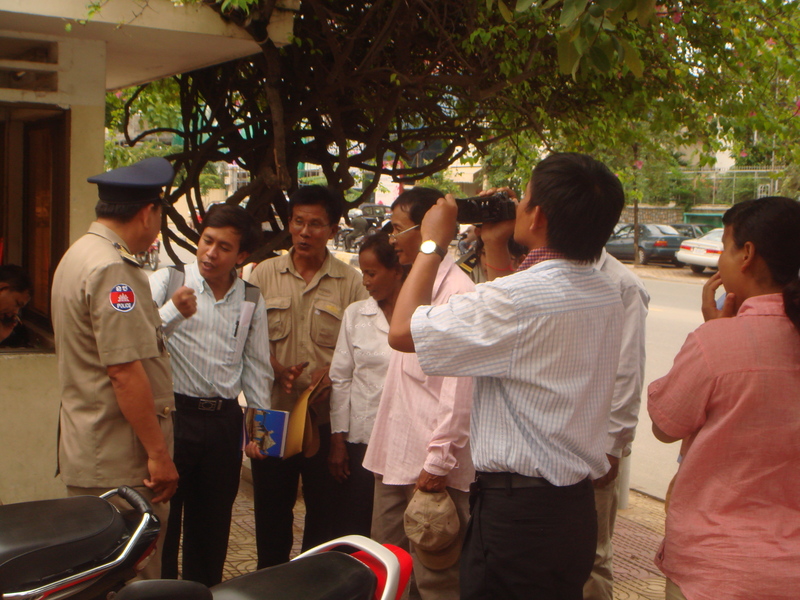 The advocates peacefully insisted on their right to pray, citing the Cambodian Constitution. 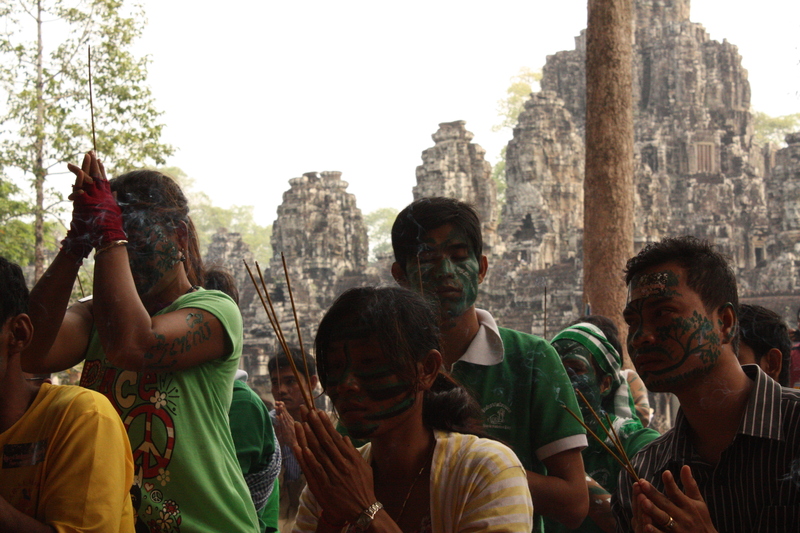 Eventually the group was allowed to form a procession around the Bayon temple and then pray at a nearby shrine. At the heart of their prayers was a call for their leaders to exercise wisdom in the management of Cambodia’s environmental resources. They decried the alarming rate at which Cambodia is losing its forests and drew a parallel between modern Cambodia and ancient Angkor, once the largest and most advanced city in the world, which collapsed due to deforestation and related water problems. They called on Cambodia and the world to heed the lesson of Angkor and preserve Prey Lang forest, Indochina’s last large expanse of lowland evergreen forest and one of the most important watersheds remaining in Cambodia. Heavy monitoring by authorities, including dozens of uniformed police, discouraged the participation of tourists. Even so, several tourists from a variety of countries took photos and even joined the praying, singing and dancing. The activists’ message was so persuasive that even some of the police and authorities applauded at the program’s conclusion. Early in the event, police attempted to detain several people including prominent network members and monk-activist Venerable Loun Sovath. Other advocates protected them by forming barriers around them and protesting the disruption of their prayer. Police later attempted to pursue the monk, making inquiries around town, but he had already departed. 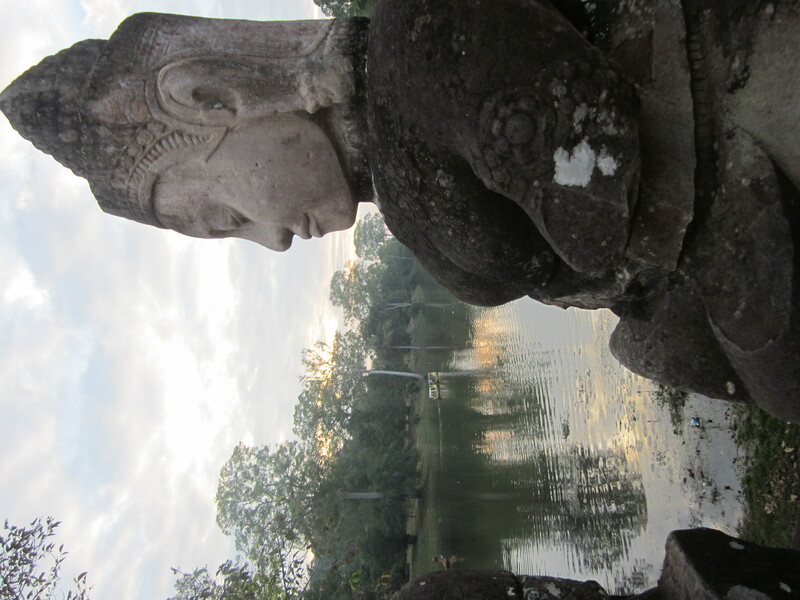 On December 14, we are gathering in the Angkor complex to pray for Cambodia and its future. Cambodia has lost its forests at an alarming rate. 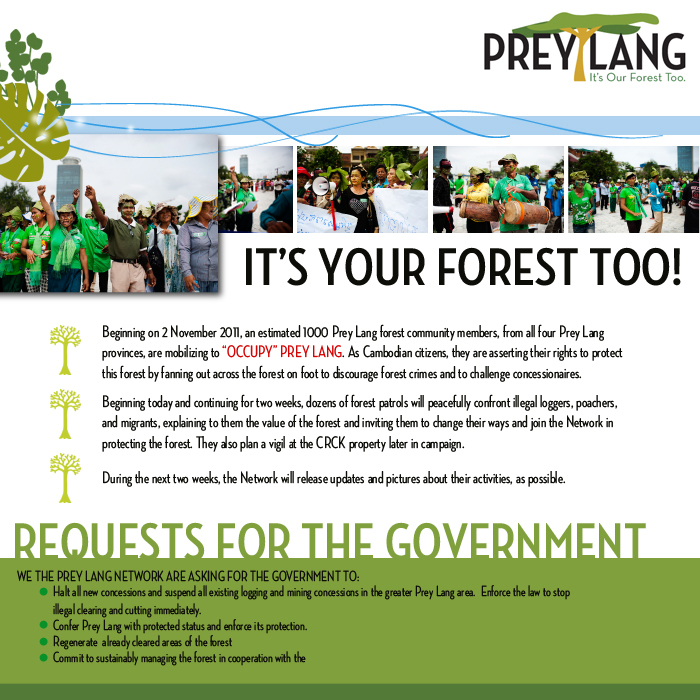 Now Prey Lang, the last large lowland evergreen forest, is at risk. Prey Lang is a national treasure. Like Angkor, it belongs to the whole country and even the world. The Angkor civilization collapsed because of deforestation and related water problems. Are we repeating this now? With forests disappearing and ground water depleted by the demands of a nearby growing city and tourism industry, some Angkor temples are at now risk. While efforts are underway to save the temples, other areas of Cambodia are also experiencing water problems as forests disappear. Let’s not repeat history. Wherever you are, please pray with us. And with your prayer, tie a green or blue thread to your wrist. In our culture, these threads that we tie to our wrists, are like a prayers that stay with us. As long as we wear the threads, we are continuing our prayers. Please Cambodian people see and analyze about Khmer forest future by own-selves . Earth Action, an international NGO based in the US, has launched a letter-writing campaign to save Prey Lang. They are encouraging folks from all over the world to write letters to Cambodia’s Prime Minister Hun Sen and several over government decision-makers to tell them why we all need to save Prey Lang. 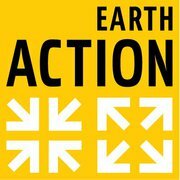 EarthAction’s mission is to inform and inspire people everywhere to turn their concern, passion and outrage into meaningful action for a more just, peaceful and sustainable world. Here is the letter that Lois Barber, EarthAction’s Director, has sent to the Prime Minister. I am writing to you as Executive Director of EarthAction, a global network of over 2,600 organizations in 16 5 countries, to urge you to do everything in your power to protect the Prey Lang forest which is an important resource for the people of Cambodia, of Southeast Asia, and of the world. The forest provides a home and livelihood for the almost 200,000 members of the Kuy community who depend upon it for their culture. 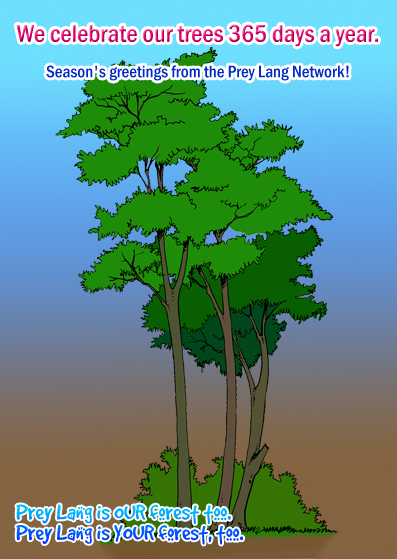 In addition, Prey Lang has great environmental importance with its seven distinct ecosystems including a unique primordial swamp forest, and its great bio-diveristy. It is also a primary watershed regulating water and sedi ment flow to the Tonle Sap Basin, and is an important fish spawning area, Prey Lang is vital for Cambodia’s long-term environmental sustainability and for food and water security. Left standing, the Prey Lang forest has among the highest carbon sequestration values in the region, and is a powerhouse for fighting global warming. Please let us know what you will do to protect this important resource. The whole word is watching and hoping for your environmental and human rights leadership. Prey Lang – It’s YOUR forest too! On August 19, Prey Lang Network members and representatives from other networks around the country, submitted petitions to 16 embassies and international organizations in Phnom Penh, urging them to take action to stop the destruction of Prey Lang and other important natural resources around the country. The petition was received by embassies of the US, China, the UK, Germany, France, South Korea, Japan, Sweden, Denmark, Australia, and Indonesia, along with the World Bank, the Asia Development Bank, the UN, and the European Union. Only the Vietnamese Embassy declined the petition, even after an hour of trying to persuade them to do so. Network representatives told reporters that they were disappointed that Vietnam did not receive the petition since many of the companies operating in the forest are Vietnamese. According to various news reports, a US Embassy spokesperson said that the US is monitoring the situation of Prey Lang. Today, 18 August 2011, 146 communities around Cambodia prepared to take part in the Prey Lang Network’s “Pray long for Prey Lang” celebration. 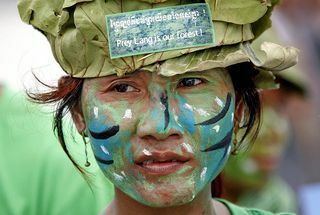 In Phnom Penh, 200 individuals – including members of the Prey Lang network dressed as “avatars”, painted in green wearing hats made from leaves, and supporters – gathered at Preah Ang Dang Keu Shrine to pray for better management of Cambodia’s land and natural resources and, particularly, for the preservation of Prey Lang forest and the ways of life of the hundreds of thousands of the forests inhabitants. After concluding their prayers at Preah Ang Dang Keu Shrine, the community members dispersed to 9 locations throughout the city to distribute leaflets in order to inform ordinary citizens about ongoing deforestation at Prey Lang. The event was marred by a crackdown on the peaceful activities of the community members, with as many as 106 individuals briefly detained and questioned. All the individuals detained have since been released. The nationwide scal e of the event, with events taking place in as many as 14 provinces, is unprecedented in Cambodia. The participating communities were or are themselves involved in land conflicts. 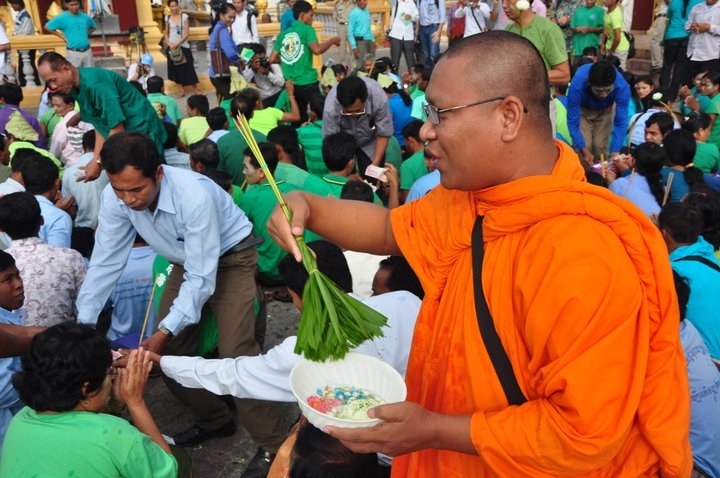 While the spearhead issue of the event was the intense ongoing exploitation and deforestation of Prey Lang forest, participants prayed for better management of all of Cambodia’s land and natural resources and for the cases affecting them directly. Information about events taking place in other parts of the country is currently being collected by the Prey Lang Network and will be shared through social media platforms. Prey Lang forest is the last large primary forest on the Indochinese peninsula and the source of livelihood for around 200,000 people, including a large portion of the country’s indigenous population. The forest is richly bio-diverse, home to 40 endangered plant and animal species and a primary watershed regulating water and sediment flow to the Tonle Sap Basin. The forest is not only essential for the Kingdom’s food and water security but, with among the highest carbon sequestration values in the region, is a powerhouse for fighting global warming. Prime Minister Hun Sen stated publicly in February 2011 that Cambodia’s forests must be protected in order to reduce global warming while Cambodia’s Forest Administration identified Prey Lang as an important area for conservation. This notwithstanding, developments around the forest have accelerated markedly recently with concessionaires clearing forest areas in order to create rubber plantations. Heng Mom, from Boeung Kak Lake offered her support for the event, stating: “The Boeung Kak Lake residents support this campaign as natural resources are vital not just to Cambodian’s but to people across the world. Protecting Prey Lang is not just important to a few but rather it is significant in protecting the environment for our children. I share with members of the Prey Lang community the experience of the residents of Boeung Kak Lake: that advocacy is continually a struggle and everyone should be ready to face all situations”. Phok Hong, an indigenous Kuy from Prey Lang, stated: “If I lose Prey Lang, I lose my life. Everyday I worry about losing Prey Lang. I worry that the land broker and the company will destroy it and I will lose my way of life. If we lose Prey Lang we lose the forest, the herbal remedies, the wild life and most importantly the indigenous traditions that have been passed down through many generations of our ancestors. Today I will pray for the world to appreciate the importance of Prey Lang and help us put and end to this conflict”. Vong Phan, an indigenous Kuy from Prey Lang stated: “The rubber plantations give only profits to wealthy individuals but if we protect Prey Lang forest it will give, not only to the ethnic Kuy people but also to everyone”.